Why top your pie with something as banal as a crust when you could top it with a springy layer of caramelized marshmallow? 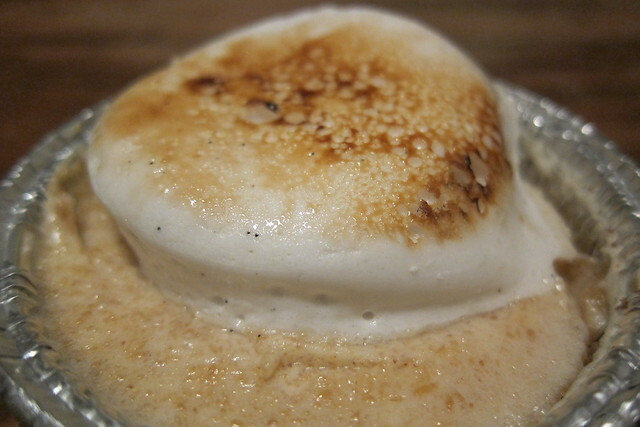 That's one of the elements that makes the Peanut Butter S'more Pie from I Heart Pies so fantastic. Not that you need to gild the lily when you've got a layer of heavenly peanut butter cream and an impossibly moist padding of graham cracker crumbs that puts traditional crusts to shame. It was one of the best desserts I tasted at Artisanal LA. Launched three years ago by 28-year-old Emily Cofrancesco, who traded in the long hours and high pay of a TV editor for the long hours and low pay of an artisanal baker, I Heart Pies specializes in pies made with fresh, local and organic ingredients. They get their apples from Oak Glen and their Jarrahdale pumpkins -- large and grayish they look like vampire pumpkins -- from Yucaipa. Cofrancesco, who has help running the business from her husband Nick, currently offers a dozen pies as well as brownies, chocolate chip cookies and a line of vegan pies. Cofrancesco plans to launch a line of savory pies by next year. For now, you'll have to catch I Heart Pies at sporadic local events or order from them online. Keep your eyes open. They're looking for a storefront in Silver Lake, Atwater Village or possibly on West 3rd Street.